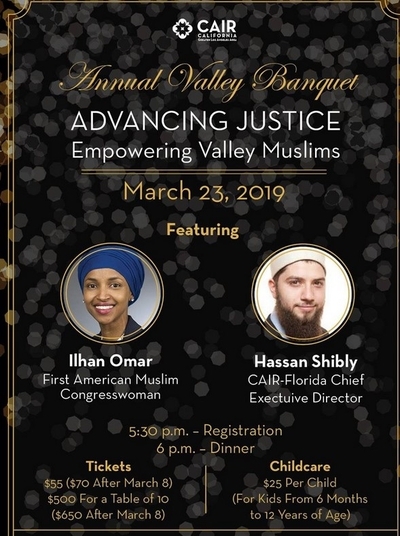 It might seem natural for the Council on American-Islamic Relations (CAIR) Los Angeles chapter to invite U.S. Rep. Ilhan Omar to speak at Saturday evening's fundraising dinner. But she also has endured a series of controversies over anti-Semitic comments which she claims are simple statements criticizing Israel. Israel "hypnotized the world" to hide its "evil deeds," she wrote in 2012. American support for Israel is "all about the Benjamins, baby," she wrote last month. And as a congresswoman, she feels pressured "to have allegiance/pledge support to a foreign country." That's a trifecta of anti-Semitism. Jewish mind control protects Israel from repercussions from its evil. Jewish money controls politics. And Israel's supporters demand that others to share their dual allegiances. CAIR and its officials have stood by Omar, saying she has exhibited "courage in speaking the truth about Israel's racial, religious and ethnic segregation" and taken a "courageous and principled stance" against the "Israeli Lobby." But what drives CAIR's opposition to the "Israeli lobby" and just about all other things related to Israel? CAIR was created in 1994 by Omar Ahmad and Nihad Awad, who were members of the Muslim Brotherhood's "Palestine Committee." Internal records seized by the FBI show that the committee was charged with supporting Hamas politically and financially. Its internal documents included CAIR among the organizations under its umbrella. One Palestine Committee report described the group's mission as "defending the Islamic cause in Palestine and support for the emerging movement, the Hamas Movement." Ahmad was a driving force within the Palestine Committee, FBI Agent Lara Burns testified in 2008, during the prosecution of the Texas-based Holy Land Foundation and five former officials. He served on its executive committee where he planned, convened and moderated an October 1993 Palestine Committee meeting in Philadelphia where members discussed ways to "derail" a U.S.-led peace agreement between the Israelis and Palestinians. The group used a simple code when talking about Hamas, reversing the spelling and calling it "Samah" instead. A witness told the FBI that Ahmad, who also went by the name Omar Yehya, became president of the Palestine Committee – an MB/Hamas-support umbrella organization – after founder Mousa Abu Marzook's deportation from the United States. Prior to forming CAIR, Ahmad and Awad worked with the Islamic Association for Palestine (IAP), which internal documents place within the Palestine Committee as a propaganda arm and organizer of fundraisers. IAP published Hamas communiques and its anti-Semitic charter. A 1992 IAP "Islamic Action Plan for Palestine," praised Hamas for "resisting the Zionist occupation [with] a lot of sacrifices from martyrs, detainees, wounded, injured, fugitives and deportees," which "restored hope and life to the Muslim nation and the notion that the flare of Jihad has not died out and that the banner of Islamic Jihad is still raised." "The Government has produced ample evidence to establish the associations of CAIR, ISNA and NAIT with HLF, the Islamic Association for Palestine ('IAP'), and with Hamas," wrote U.S. District Judge Jorge Solis, who presided over the Holy Land trial. The FBI, which obtained that evidence, broke off relations with CAIR in 2008, explaining, "unless we can resolve whether there continues to be a connection between CAIR or its executives and HAMAS, the FBI does not view CAIR as an appropriate liaison partner." That remains the FBI's posture more than a decade later. While Ahmad left CAIR's national board, Awad remains CAIR's executive director. Awad publicly expressed his support for Hamas in 1994, the same year CAIR was created. He has never retracted that support or directly condemned Hamas. "CAIR has been identified by the Government at trial as a participant in an ongoing and ultimately unlawful conspiracy to support a designated terrorist organization, a conspiracy from which CAIR never withdrew."